With the revolutionary steps made in space exploration, and a whole universe to explore, many questions relating to far off solar systems and galaxies arise; Are any planets other than our own habitable? How many of them have atmospheres? The more our technology advances, the deeper we can see into space, the more our curiosity arises. But one question that has always captured a lot of public interest is whether there is extraterrestrial life. There is a burning desire to know: are we alone? How do we look for life on other planets? Scientists keep a look out for ‘biomarkers’ when searching for alien life. Biomarkers are the characteristics of the Earth’s atmosphere that, when present on other planets, indicate the possibility of life. These include the presence of molecular oxygen, water, carbon dioxide and methane. While we don’t know that other planets would display all these signs, it again acts as a good starting place, and a logical indicator of possible life. The problem faced when attempting to detect biomarkers on distant exoplanets is due to their relative proximity to their star in comparison to Earth. This means the light we observe from these planets is often masked completely by the radiation emitted from the star they are orbiting, making analysis of their light far more complex. Even when a planet is directly observable, an extremely high resolution telescope is required to distinguish between the light from the planet and the light from the star. To a lesser extent, radiation from other distant objects can also make it harder to distinguish what radiation is attributed to the planet, even our own atmosphere can result in interference that can confuse results. A telescope's resolution is directly related to its size, meaning ground based telescopes are limited by the distance of the atmosphere. Technological progress has allowed for images from ground based telescopes to be improved after capture, but this is still not enough to produce images of exoplanets that we can always draw information from. Space based telescopes require far more funding and, given the challenging environment, are far harder to implement. Without progress in telescopic imaging, it is not always easy to detect these biomarkers, and consequentially we face a barrier in the search for life. Learn more about The Search for another Earth. Methane has been detected in the martian atmosphere both by Earth-based telescopes, and by the European Mars Express mission. The lack of a magnetic field around Mars means that this methane can be easily destroyed by cosmic radiation. Therefore the fact that its abundance seems to remain fairly constant implies methane production on Mars. Methane is usually associated with organic processes (as the output of processes involving life), however there are other means by which it can be produced. These include geochemical mechanisms such as a process known as serpentinisation, as well as the recently demonstrated release of methane from meteorites bombarded with UV radiation under Mars-like conditions. More data are needed from the regions of the martian surface where this methane has been detected to begin to determine it's source, however the issue is clouded by the fact that these processes are not mutually exclusive, and so even if we can identify one of these occurring, it does not rule out the possibility of methane being produced simultaneously by an alternative process. Is there life on Mars? Probably not, though if there's water at the poles and possibly underground, it remains a possibility. If there is, it's certainly in the form of microbes rather than anything more advanced. Perhaps a better question though, is was there ever life on Mars? Since we now believe there was once liquid water on the surface, this is a very strong possibility, but we have no evidence of it yet. 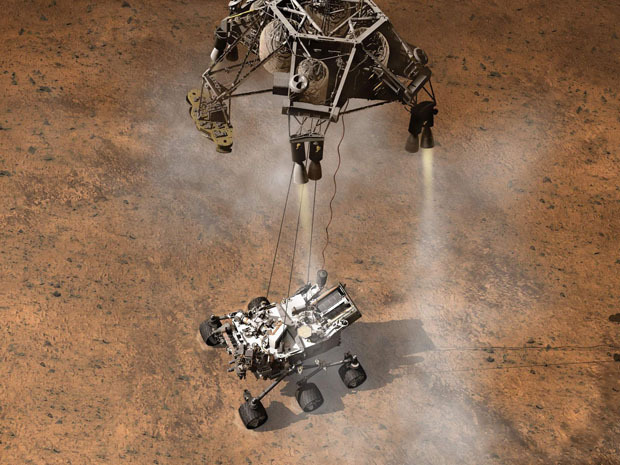 This question is a driving force behind several Mars missions from Curiosity (NASA) to ExoMars (ESA). Just as it has on Mars, methane has been detected in the atmosphere of Saturn's moon Titan. These observations have been confirmed both by Earth-based telescopes, and by the Cassini mission, which has also spotted shallow lakes of methane around the moons tropics. Calculations suggest that this methane ought to have been broken up by cosmic radiation within 50 million years or so (a very short time when compared to the age of the Solar System itself). Therefore it's present abundance seems to indicate that the methane in the atmosphere is being replenished from a source on Titan itself. Methane is usually associated with organic processes (as the output of processes involving life), however there are other potential sources. These include Cryovolcanoes (volcanic type features which release water and other gas/liquids with low melting points, on colder worlds than our own). Titan has a thicker atmosphere than Earth, layers of which are almost entirely opaque to visible light. As a result, we have no good images of the Titanian surface, and are thus unable to say for sure what the source of the methane on Titan is. Each solar system has a theoretical zone where the atmospheric pressure and temperature of the planets within is sufficient to allow for surface water to be present. These are known as Circumstellar Habitable Zones or, more colloquially, Goldilocks zones. This is used as an indicator for possible alien life, as for life as we know it to exist, water is a necessity. A planet is determined to be within or outside of the zone depending on its orbit, its mass and the amount of power radiated by the star it’s orbiting. Being within the Habitable Zone does not guarantee the presence of water, just defines whether the conditions are suitable. There are also other factors necessary for an ‘Earth like’ planet such as atmosphere, which this does not consider. However it does rule out celestial bodies with water being found outside a habitable zone, hence acting as a good starting point for the search for alien life. Since the concept was presented, many stars have been found to have a planet within their habitable zone, in fact some have been observed with multiple planets within the zone. This again seems to support the idea that other ‘Earth like’ planets exist. Doubts have been raised, however, about the validity of these habitable zones, as surface water is thought to have been detected on celestial bodies outside a zone, most commonly via absorption spectroscopy - a method of analysing the light from a body to determine its composition. The water present on these planets can be maintained by processes such as tidal heating and radioactive decay, or pressurized by other means. It is also thought to be possible for water to be present on rogue planets or their moons. So while these zones may be a good place to start the search for extraterrestrial life, maybe we should not limit ourselves to searching solely within their scope. Learn more about Are Exoplanets Habitable?. Scientists have been discovering planets outside of our own solar system since 1988, and the rate at which these have been found has increased dramatically in recent years, with over ten times as many being found in the second decade of discovery than the first. The nature of these planets is varied and the possibility of any of them supporting life depends upon a myriad factors. Not all stars have the exact same elemental make-up however, containing different quantities of heavier elements (other than Hydrogen and Helium). The different composition of these stars directly affects the rate at which they burn, and so the lifetime of the star. This will affect the position, and lifetime, of the region around the star in which liquid water could exist. The composition of these stars may also affect the nature of the atmosphere and geological evolution of the planets which form around them, and thus how suitable these may be for life to arise on. We cannot always measure the complete composition of these stars because some elements are present in quantities too small to be detected by traditional spectroscopic techniques. As for the composition of the planets themselves, we do not know enough about planetary formation to understand exactly how these may be affected yet. An additional problem to finding evidence of life outside of our solar system is the ability to find the planets (or moons) hosting that life. Although this is difficult, it is not entirely impossible - although so far, only extremely large planets far bigger than Jupiter have been directly imaged. Learn more about Detection and Discovery of Exoplanets. Is All Life Dependent on Water? For life as we know it to be viable, water is a necessity. Humans are composed of 60% water and cannot survive without it for more than a few days. This is not to say this is the same for all species on Earth, the level of dependency does vary, however every known organism requires water to live. So far this article has has explored how scientists try and identify planets they deem capable of supporting life, and the presence of water has been the recurring theme. Now this is an obvious first step, and a logical progression - all life on Earth relies on water, therefore when on the hunt for alien life, we start our search on planets that also have water. However, This does not necessarily mean that life is dependent on water universally. We just don’t know how life might have developed elsewhere. It is possible that other life forms may have evolved with alternative biochemistries, reliant on other elements all together. Scientists are fairly certain that some form of liquid is necessary to life, but again this cannot be ascertained. So, while beginning our search within the realms of habitable zones or more generally on planets that reveal a presence of surface water, we should by no means rule out the possibility of finding life on a planet completely unlike Earth. A further puzzle we are yet to answer, is how does life begin on Earth or other planets? While speculations have been made about how life begins, we are yet to find an overruling theory. The Fermi Paradox states that there is a contradiction between the estimates of probability of civilized alien life, and the lack of supporting evidence. To understand why scientists think there is such a high probability of alien life we must get an idea of scale. The observable universe is the universe that can, in principle, be viewed from Earth at this point in time. For anything further away, there will not have been time due to the expansion of space (since the Big Bang) for the light to have reached Earth. It spans over 93 billion light years, giving us an estimate of at least 100 billion galaxies within observable range from Earth. Given that there are billions of stars that are older than our own sun, with orbiting planets far older than our Earth, and assuming that our Earth is by no means extraordinary, we reach the conclusion that it is very likely there will be other Earth-like planets in the observable universe. These ‘Earth-like’ exoplanets would have been capable of supporting life for much longer than our own Earth however, so the evolution of their life forms and their possible civilizations could be leaps and bounds ahead of our own. Extrapolating our own species' progress in space travel and exploration, we could colonise a galaxy in tens of millions of years, so if these planets are billions of years older, it follows that they could be far further along in the field of space exploration than us, and could quite possibly be fully aware of our existence. And yet we have no evidence for their existence. It is possible that intelligent life arises frequently in the universe, but invariably faces extinction before contact can be made. The organisation SETI (The Search for Extraterrestrial Life) attempts to explore the origins of life in the universe, the nature of such life, and how widespread alien life is (if at all). Given our interest in what’s out there, many people have attempted to come up with explanations for this paradox, but none have supporting evidence and so the question still stands unanswered. Maybe, against all odds, we are alone. Or maybe we’re just still in the dark. Learn more about Where is Everyone? The Fermi Paradox, Astrobiology and Exoplanets. How life began on Earth is still a much debated topic. It is generally accepted that life began in water, but this contradicts with what we know about the necessary building blocks for life; one of the crucial ingredients for life, RNA, is unstable in water, unless the water has a high enough boron content. Boron is necessary for life because it stabilizes ribose, the “R” out of RNA’s three components. However it is believed that when life began on Earth there was hardly any boron in the water. So this leaves us asking, how did life begin? One hypothesis, Panspermia, considers the possibility that life in fact began outside of our Earth. The most likely scenario for this hypothesis involves life originating on Mars. It is thought that boron was far more plentiful on Mars and this is supported by the fact that boron was found on a martian meteorite. While this may seem far fetched, the idea that basic martian life could have travelled over on an asteroid and evolved on Earth at least answers RNA’s ‘water problem’. So are we in fact the long lost descendants of martians or is there something we’re missing? Learn more about origin of life. Maybe we are yet to come across alien life, because Earth is fundamentally unique. However, with probability in our favour, it’s likely we will stumble across alien life eventually. The next question will be, do we want to? This article was written by the Things We Don’t Know editorial team, with contributions from Andrew Rushby, Ed Trollope, Jon Cheyne, and Holly Godwin. This article was first published on 2017-11-26 and was last updated on 2017-11-26.